^ 3.0 3.1 Murray 2000, p. 30. ^ 4.0 4.1 Runciman 1989a, p. 146. ^ 7.0 7.1 7.2 7.3 Murray 2000, p. 203. ^ 10.0 10.1 Tanner 2003, p. 84. ^ Murray 2000, pp. 21, 32-34. ^ Murray 2000, p. 32. ^ 13.0 13.1 Lock 2006, p. 20. ^ 15.0 15.1 Murray 2000, p. 35. ^ 17.0 17.1 Runciman 1989a, p. 147. ^ Murray 2000, p. 52. ^ 24.0 24.1 24.2 Tyerman 2006, p. 110. ^ 25.0 25.1 25.2 Runciman 1989a, p. 150. ^ Runciman 1989a, pp. 150-151. ^ Barber 2012, pp. 7-8. ^ Tyerman 2006, pp. 130-131. ^ 35.0 35.1 35.2 Tyerman 2006, p. 131. ^ Phillips 2010, p. 16. ^ 37.0 37.1 Barber 2012, p. 75. ^ Runciman 1989a, pp. 197-198. ^ 41.0 41.1 Asbridge 2004, p. 144. ^ 43.0 43.1 Runciman 1989a, p. 198. ^ 44.0 44.1 44.2 Tyerman 2006, p. 132. ^ 45.0 45.1 45.2 Asbridge 2004, p. 145. ^ 46.0 46.1 Runciman 1989a, p. 199. ^ 48.0 48.1 Asbridge 2004, p. 146. ^ 49.0 49.1 49.2 MacEvitt 2010, p. 57. ^ 50.0 50.1 50.2 50.3 Asbridge 2004, p. 147. ^ 51.0 51.1 Lock 2006, p. 22. ^ 52.0 52.1 Runciman 1989a, pp. 200-201. ^ 53.0 53.1 Runciman 1989a, p. 200. ^ Asbridge 2004, pp. 149-150. ^ 55.0 55.1 MacEvitt 2010, p. 61. ^ 56.0 56.1 56.2 Runciman 1989a, p. 201. ^ 57.0 57.1 57.2 57.3 Asbridge 2004, p. 150. ^ 59.0 59.1 59.2 Runciman 1989a, p. 204. ^ 60.0 60.1 France 1994, p. 132. ^ 61.0 61.1 Lock 2006, p. 23. ^ Asbridge 2004, pp. 150-151. ^ 63.0 63.1 Maalouf 1984, p. 30. ^ 64.0 64.1 MacEvitt 2010, p. 67. ^ 65.0 65.1 65.2 Asbridge 2004, p. 151. ^ Runciman 1989a, pp. 205-206. ^ MacEvitt 2010, p. 69. ^ 70.0 70.1 Runciman 1989a, p. 206. ^ 72.0 72.1 Tyerman 2006, p. 134. ^ France 1994, p. 133-138. ^ 77.0 77.1 Runciman 1989a, p. 208. ^ 78.0 78.1 78.2 78.3 78.4 Murray 2000, p. 182. ^ 79.0 79.1 MacEvitt 2010, p. 64. ^ 80.0 80.1 80.2 Runciman 1989a, p. 210. ^ 83.0 83.1 83.2 83.3 MacEvitt 2010, p. 72. ^ 85.0 85.1 85.2 Runciman 1989a, p. 211. ^ Runciman 1989a, pp. 210-211. ^ 87.0 87.1 87.2 87.3 87.4 Lock 2006, p. 25. ^ 88.0 88.1 France 1994, p. 133. ^ Runciman 1989a, pp. 302-303. ^ Runciman 1989a, p. 303. ^ Runciman 1989a, p. 307. ^ 96.0 96.1 Barber 2012, p. 61. ^ 98.0 98.1 98.2 98.3 98.4 Barber 2012, p. 62. ^ 101.0 101.1 Maalouf 1984, p. 63. ^ Runciman 1989a, p. 325. ^ 105.0 105.1 105.2 105.3 MacEvitt 2010, p. 117. ^ Murray 2000, p. 73, 96. ^ Barber 2012, p. 62-65. ^ 109.0 109.1 Barber 2012, p. 65. ^ 110.0 110.1 110.2 110.3 110.4 Barber 2012, p. 73. ^ 111.0 111.1 111.2 Runciman 1989b, p. 72. ^ 112.0 112.1 112.2 Runciman 1989b, p. 73. ^ 116.0 116.1 116.2 Runciman 1989b, p. 82. ^ 119.0 119.1 Runciman 1989b, p. 75. ^ Runciman 1989b, pp. 74-75. ^ 121.0 121.1 121.2 121.3 Barber 2012, p. 70. ^ Barber 2012, pp. 73-74. ^ 123.0 123.1 Lock 2006, p. 27. ^ 124.0 124.1 124.2 Barber 2012, p. 74. ^ Runciman 1989b, pp. 76-77. ^ Runciman 1989b, pp. 79-80. ^ Runciman 1989b, pp. 83-84. ^ 133.0 133.1 Runciman 1989b, p. 87. ^ 135.0 135.1 135.2 Runciman 1989b, p. 88. ^ 136.0 136.1 Lock 2006, p. 28. ^ Barber 2012, pp. 68-69. ^ 140.0 140.1 Runciman 1989b, p. 89. ^ 141.0 141.1 141.2 Barber 2012, p. 71. ^ 142.0 142.1 142.2 Runciman 1989b, p. 90. ^ 143.0 143.1 Runciman 1989b, p. 91. ^ 146.0 146.1 146.2 146.3 146.4 Barber 2012, p. 91. ^ Barber 2012, pp. 84，91-92. ^ 148.0 148.1 Lock 2006, p. 30. ^ 149.0 149.1 149.2 Barber 2012, p. 92. ^ Barber 2012, pp. 91-92. ^ 153.0 153.1 Runciman 1989b, p. 69. ^ 155.0 155.1 Barber 2012, p. 93. ^ 156.0 156.1 156.2 156.3 Runciman 1989b, p. 92. ^ 157.0 157.1 Maalouf 1984, p. 81. ^ Runciman 1989b, pp. 115-116. ^ 159.0 159.1 159.2 159.3 Runciman 1989b, p. 116. ^ 161.0 161.1 161.2 Runciman 1989b, p. 117. ^ 162.0 162.1 Maalouf 1984, p. 88. ^ Hillenbrand 2000, p. 82. ^ 164.0 164.1 Runciman 1989b, p. 122. ^ 166.0 166.1 Runciman 1989b, p. 93. ^ Lilie 1993, p. 86. ^ Runciman 1989b, pp. 93-94. ^ Lock 2006, p. 32. ^ Runciman 1989b, pp. 126-127. ^ 173.0 173.1 173.2 173.3 Tyerman 2006, p. 203. ^ 174.0 174.1 Maalouf 1984, p. 87. ^ 175.0 175.1 Lock 2006, p. 33. ^ 176.0 176.1 Runciman 1989b, p. 98. ^ 177.0 177.1 177.2 177.3 Barber 2012, p. 105. ^ Runciman 1989b, pp. 98-99. ^ 180.0 180.1 180.2 180.3 180.4 Barber 2012, p. 115. ^ 181.0 181.1 181.2 Barber 2012, p. 116. ^ 184.0 184.1 Hillenbrand 2000, p. 52. ^ 186.0 186.1 Murray 2000, p. 118. ^ Murray 2000, pp. 118-119. ^ 188.0 188.1 Barber 2012, p. 117. ^ 189.0 189.1 Tyerman 2006, p. 202. ^ Tyerman 2006, pp. 202-203. ^ 191.0 191.1 191.2 Maalouf 1984, p. 64. ^ Runciman 1989a, pp. 208-209. ^ 201.0 201.1 201.2 Barber 2012, p. 113. ^ Barber 2012, pp. 113-114. ^ 204.0 204.1 Phillips 2010, p. 51. ^ Runciman 1989b, pp. 92-93. Jaspert, Nikolas. The Crusades. Routledge. 2006. ISBN 0-415-35967-8. Phillips, Jonathan. Holy Warriors: A Modern History of the Crusades. Vintage Books. 2010. ISBN 978-1-8459-5078-1. Lilie, Ralph-Johannes. Byzantium and the Crusader States 1096-1204. Oxford University Press. 1993. ISBN 0-19-820407-8. France, John. Victory in the East: A military history of the First Crusade. Cambridge University Press. 1994. ISBN 0-521-41969-7. Tanner, Heather J. 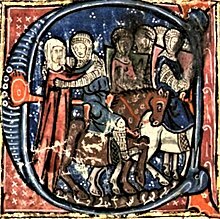 In His Brother's Shadow: The Crusading Career and Reputation of Eustace III of Boulogne. (编) Semaan, Khalil I. The Crusades: Other Experiences, Alternate Perspectives: Selected Proceedings from the 32nd Annual CEMERS Conference. Global Academic Publishing. 2003: 83–100. ISBN 1-58684-251-X.